What Ryder and those who know him will say is that he’s more than a Jeopardy clue. Ryder grew up in Kaneohe, Hi. with a tight-knit family consisting of his parents Mike and Wendy, brother Blaze and sister Kealani Kuuipo. As a kid Ryder wanted to be an NFL player, frequently meeting all-stars who traveled to the state every year for the Pro Bowl. He played football, baseball and basketball and naturally loved the water, frequently taking to the ocean to surf, bodyboard and stand-up paddleboard. Named after the song “Wave Rider” by Butch Helemano, a popular Hawaiian reggae singer, Ryder is frequently the topic of conversation wherever he goes. “Every time [someone asks] for my name I’ll have to show them my ID and they’ll be like ‘Okay McLovin’ and I’ll be like ‘No. That’s my real name. It’s not a fake ID,'” Ryder said. He often has to show two forms of identification if people don’t believe him. First, he’ll pull out his Hawaii ID. Then, if that’s not enough, he’ll bring out his military ID for confirmation. Coming out of high school at Kamehameha Schools-Kapalama, Ryder had verbally committed to play at Utah State University, his only Division I offer at the time. On New Year’s Day 2010, fresh off a 35-13 Texas Bowl victory over Missouri to cap off a 10-4 season, Navy head coach Ken Niumatalolo gave Ryder a call. 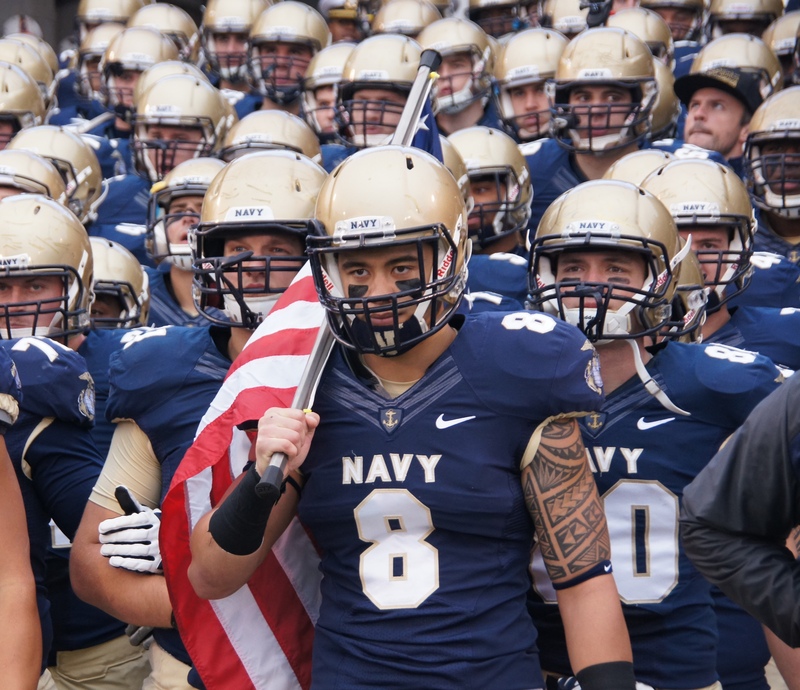 The ties between Hawaii and the Navy football team were already strong. Niumatalolo is a Hawaii native with strong roots to the state and some of Ryder’s friends were already on the team. “I had already had people I played with in high school already at the academy so I gave them a call and talked to them for a little bit,” he said. Three weeks later, Ryder visited the Naval Academy in Annapolis, Md. with his family, who fell in love with the waterfront campus and what the school had to offer. That visit sealed the deal for him and his family. Two weeks after that he decided to commit to Navy and move 4,846 miles away from home to play safety for the Midshipmen. During the 2010 season, Ryder began on Navy’s junior varsity squad but eventually moved up to play in four games for the varsity team during the season, making his debut on special teams against powerhouse Notre Dame at MetLife Stadium in East Rutherford, N.J. He worked his way up to play in 12 games in 2011 and 13 in 2012, starting six. As a senior in 2013, he started 11 games and played in all 13 on the way to a 9-4 season and an 5-0 record at Navy-Marine Corps Memorial Stadium. During his four seasons at Navy, Ryder played in the 2010 Poinsettia Bowl, 2012 Fight Hunger Bowl and capped his career off with a victory in the 2013 Armed Forces Bowl. In his final season, Ryder was one of a select few to lead his team onto the field holding an American flag before each game. As a young man in Hawaii, Ryder wasn’t fully aware of the significance of the historic Army-Navy game but still tuned in to watch the highly-anticipated rivalry on TV. As a freshman, the realization finally clicked for Ryder. He could feel the electricity when stepping onto Lincoln Financial Field in Philadelphia before the 110th meeting of these respected institutions. Ryder was brought up as a University of Hawaii Warriors football fan. His family owned Hawaii season tickets in 2007 when the Warriors went 12-1 and made an appearance in the 2008 Sugar Bowl. His favorite player was former safety Leonard Peters, who he tried to model his style of play after. So when November 9, 2013 rolled around, he was amped. The Warriors traveled to Annapolis to take on the Midshipmen in Ryder’s second-to-last home game donning the blue and gold. “I didn’t care if we won one game but we had to beat Hawaii,” he said. Ryder logged a season-high 12 tackles against his home school on the way to a 42-28 Navy victory. Despite his love and interest in the University of Hawaii, his recanted verbal commitment to Utah State and the rigorous schedule Midshipmen must follow on a daily basis, Ryder said he has no regrets about opting to build a new life at the Naval Academy. Ryder is currently working with the Navy football team as a graduate assistant, helping with video production and aiding the recruiting department. In January, Ryder will travel to Naval Air Station Pensacola in Florida, where he will train to become a Navy pilot. Ryder logged 10 flight hours soloing in a Piper Warrior during basic training. He will then advance to training in a T-6. Ryder will spend the next eight years as a pilot. He will earn his wings once he graduates flight school in two years and then report to his assigned squadron, where he will likely fly overseas. Looking back on his four years spent at the Naval Academy, Ryder has some advice for anyone considering the opportunity to be a Midshipman.